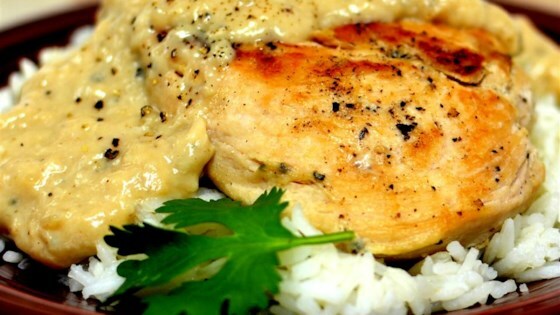 "Just four ingredients - chicken, salt, pepper and milk - is all this simple dish takes! Try it, you will be surprised. Serve over hot, fluffy rice if desired." Season chicken with salt and pepper (no such thing as too much, since this is the only seasoning this dish has)! Heat oil in a medium skillet over medium high heat and add chicken. Saute until browned, about 5 minutes each side, then add milk (enough to cover 3/4 of the chicken). Reduce heat to low and simmer for 2 hours, uncovered. Remove chicken and use juices in skillet as a sauce. I did not care for this recipe. The milk curdled right away, and I had to add country gravy mix to salvage it. 2 hours to long for me. If you simmer it too long, the chicken dries out. It is a healthy main course, though.